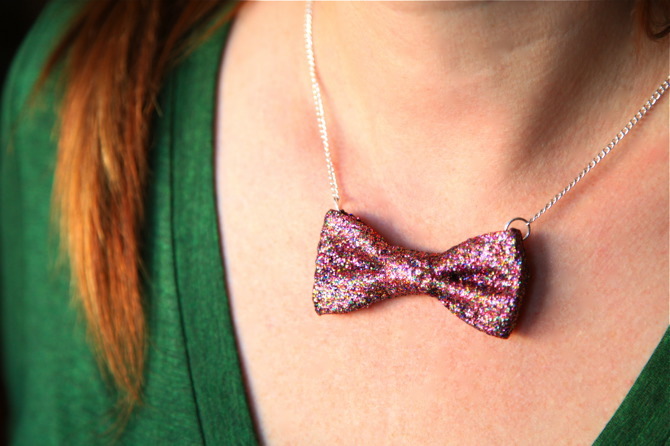 This morning I showed you how to make a no-sew leather bow necklace, which was in a bronze leather. 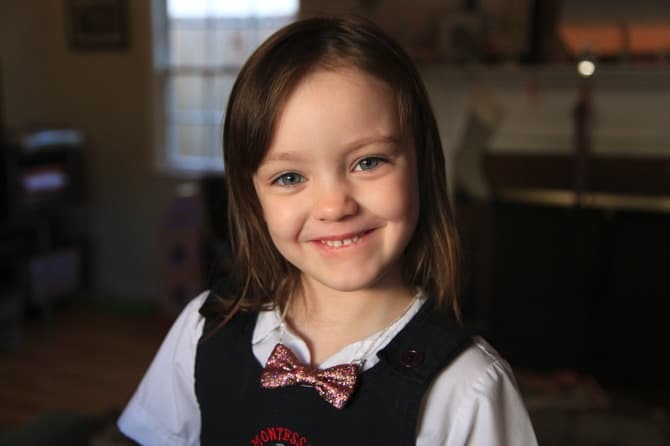 My daughter caught site of it and she HAD TO HAVE ONE, but of course she required sparkles for her bow necklace. The glitter bow was quite simple to make, and now I want to make glitter bows for everything – hair clips, shoe clips, buttons, I could go on forever. That is one happy girl with one glittery necklace. She has worn it every single day since the day I gave it to her. You will need ribbon, mod podge, glitter, and a brush. Cut ribbon and tie into a bow. You can do it the same way we did with the leather in the DIY: No-sew Leather Bow Necklace post, or anyway you please. 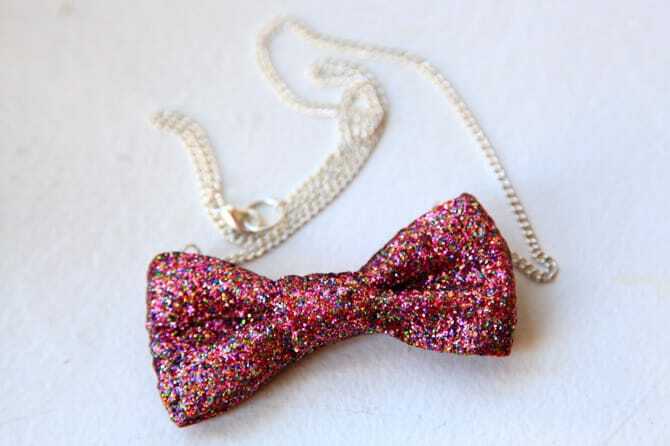 You can glitter the bow one of two ways. 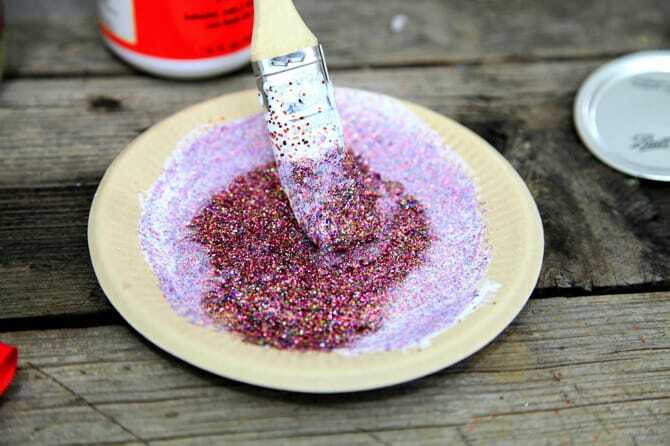 You can mix the glitter and mod podge together at a ratio of 2/3 glitter to 1/3 mod podge, then brush on. Do about three coats and let dry between coats for at least 20 minutes. 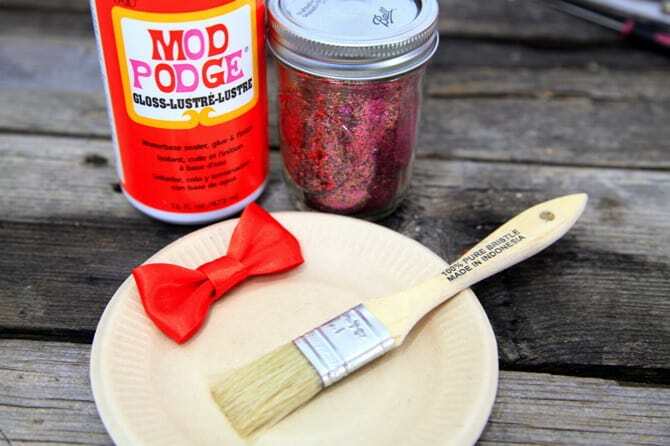 The other option is to coat the bow in mod podge, then shake your glitter on top. If you do it this way, you’ll want to wait until the mod podge dries, then seal the bow by spraying with an acrylic or polyurethane sealer. I’ve done it both ways and both work just as well. FYI, I created this multi-colored glitter by scraping up all the glitter leftovers from a year’s worth of crafting-with-my-kid projects and putting it in a mason jar. I knew I would eventually use it for something! 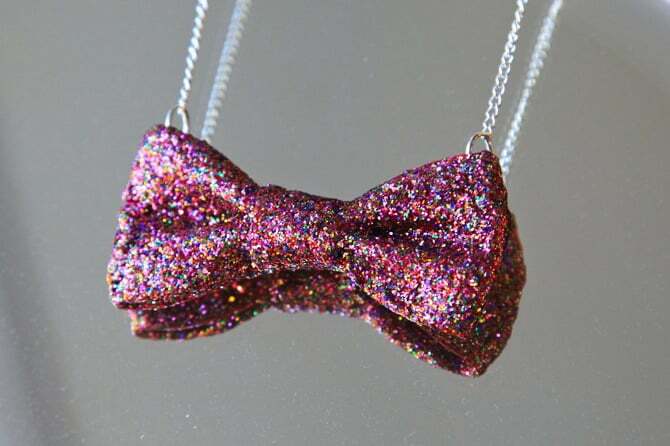 Once your glitter bow is dried and sealed, follow the exact same steps to attach your hardware that are detailed in the DIY: No-sew Leather Bow Necklace post. You’re done! Make one for all the little (and big!) girls in your life. Yes!! So pretty, I think my 3 year old will be getting one of these very soon! Love this! Your daughter is working it! And I really love the colour of the glitter, funny how you came up with it! I love it! So cute. BTW where do you get your glitter?